The village of Grappenhall has a long history that goes all the way back to the bronze age and as a result has all periods of architecture including quite a lot of houses with Victorian tiled hallways . 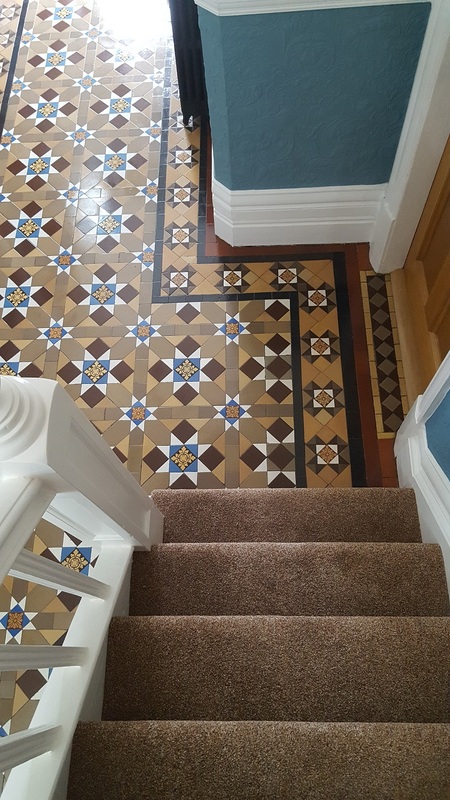 This particular floor at a house in the village had been well looked after well by the owner but had now lost its vibrancy, was looking dull and now needed a deep clean and reseal. 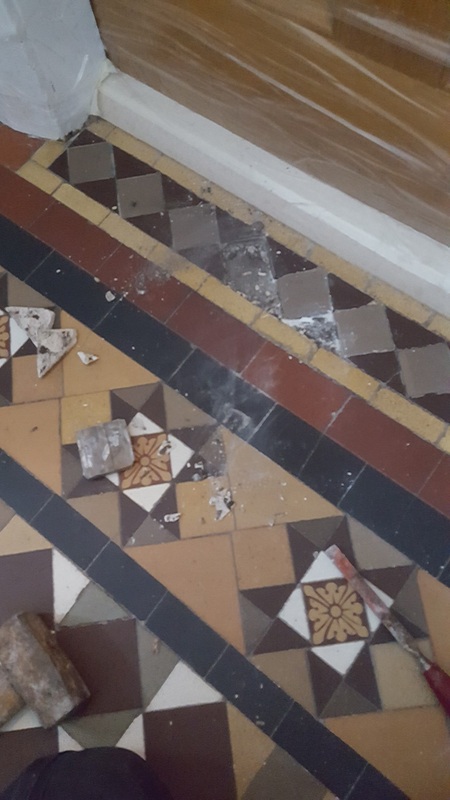 Victorian tiles are porous and so need to be sealed to protect them from dirt becoming ingrained in the floor. However, hallway floors get a lot of foot traffic which over time wears down the sealer until it becomes so thin and patchy it’s no longer effective. As a result, you need to regularly top up the sealer or every three to four years it will need to be stripped off and reapplied. I used clear plastic to protect the wood skirting boards from splashing and then gave the tiles a good scrub with a mixture of Tile Doctor Pro-Clean and Remove and Go to deep clean and strip off any remaining sealers. The cleaning solution was left to soak in for ten minutes before scrubbing it in with a black pad fitted to a heavy buffing machine. Once the whole area had been scrubbed I rinsed off with water which was then extracted using a wet vacuum. With the floor now clear I was able to inspect it to ensure all the previous sealer and ingrained dirt had been removed. Any areas with stubborn stains were spot treated by reapplying the cleaning concoction I used earlier before leaving the floor to dry off fully overnight. When I returned the next morning my first job was to test the tiles for damp using a damp meter. This is important as damp tiles won’t take the sealer as well as dry tiles, however this time everything was fine. I then proceeded to seal the Victorian tiles with a single coat of Tile Doctor Colour Grow to enhance the natural colours in the tile before applying a further seven coats of Tile Doctor Seal and Go which leaves a sheen finish and is ideal for Victorian tiles. 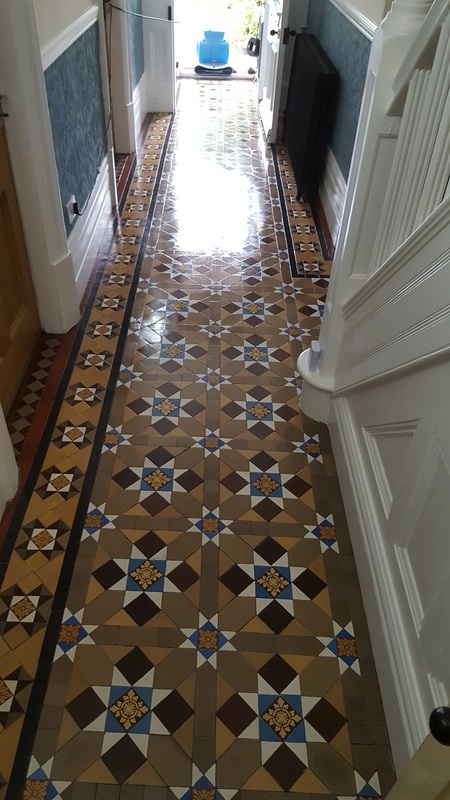 The hallway now looks fantastic and vibrant and then new sealer will protect them from ingrained dirt making them easier to clean and keep them looking good for some time to come. 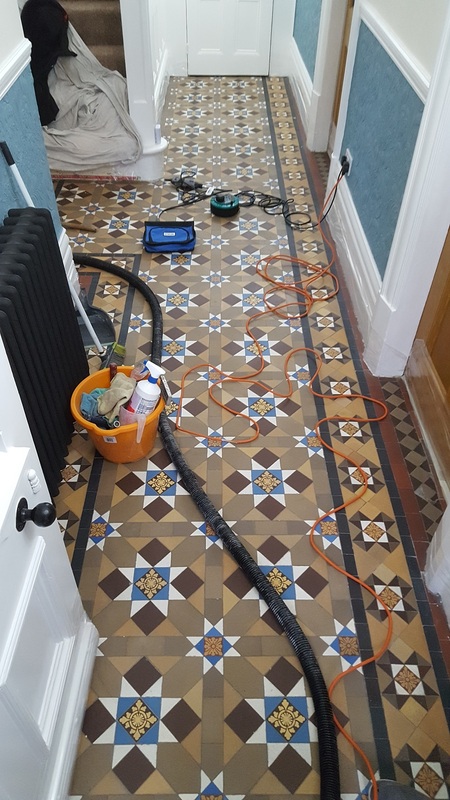 This entry was posted in Victorian Posts and tagged cheshire, Cleaned, Grappenhall, hallway, restoration, Sealed, Tiled, victorian, Village, Warrington, Warrington Tile Cleaning, Warrington Tile Sealing by AbzDominise. Bookmark the permalink. Covering Cheshire and the surrounding area Alastair Robb is an agent of Tile Doctor, the largest Tile and Stone cleaning network in the UK who have developed the products and techniques to handle a multitude of issues surrounding tile restoration including stone and grout internal or external.